Accepting Lucas the Angel's visit to Paco on Twelfth Night was not easy for me. None of us--Paco's Gypsy tribe, María my housekeeper and her husband José the handyman, the Jesuit doctor, my special friend the Jesuit historian, or the two nuns--had actually seen Lucas in the flesh, or the feathers, as it were, when he supposedly sat on a box and prophesied that his mother would have another child. The prophecy had turned out to be true. Lucas's mother was indeed pregnant, and not even she had known until Lucas appeared to her in a dream. This was evidence that something or someone not of this world had visited Paco in the corral at El Mesón, the old hacienda I rented in a Mexican town. Lucas's visitation had also resulted in Paco's rescue from a devastating state of depression. He thought himself abandoned by God. But knowledge imparted by Lucas--that heaven had intended Paco to be a perfectly formed child and that the malformation of his limbs derived from an unknown force--had brought sunshine back into his life. My Jesuit friend, the historian Father Diego, and I discussed many aspects of the situation during an afternoon walk with my dachshunds the day before I joined the Gypsies on their new tour. "Do you feel Paco is merely a religious hysteric, or is he a true mystic?" I asked. Father Diego laughed. "Odd, I was going to ask what you think about that! You'll be riding at his side for a few weeks. Let's agree that the burden of finding out falls on YOUR shoulders. " "So much for the infinite wisdom of the Society of Jesus!" I protested. "You types should know these things better than I!" He smiled again. "Sometimes my intellect deserts me in matters of the soul. I am rather like the younger nun who was with us that night in the corral. I thought it kind of you to let her carry on about 'the angel's feather' when she found it near the box where Lucas presumably sat during the visitation." I sighed and shrugged my shoulders a bit. "The good sister doesn't need to know that's where María plucks the chickens she raises at the back of the garden. You noticed my housekeeper kept mum as well. Letting the feather go as a holy relic to reward the faith of a sweet and childlike nun might earn kudos from heaven, which was better than allowing you to think of her as a sloppy housekeeper." We walked in silence for awhile, coming to the edge of the wide barranca, or gorge, at the bottom of which nestled our town. Father Diego, arms crossed on his chest, gazed at the majestic dome of the sky. "I suppose I'm reluctant to pass judgment on Paco and his angel because of his youth. Children! Think of the children who have had superlative spiritual visions of God's kingdom. Is it the lack of dogmatic clutter, their innocence, that lets them see what adults cannot? In the mid-nineteenth century, a young French girl named Bernadette Soubirous glimpsed heaven's beauty in the garbage dump at Massapiel, which would become the blessed grotto of Lourdes." He spread his arms wide. "And then there were the children of Fatima! Look at the sky and imagine we are in Portugal. It is 1917, and we are here with the children of Fatima and thousands of pilgrims who believe their story of the appearance of the Virgin. The children expect a sign from God to confirm the truth of the vision. Oh, look! The sun is falling!" Father Diego pretended to shy away in fear. He chuckled. "That's what the multitude swore they witnessed that day as the Virgin, again seen only by the children, predicted the end of the Great War. The pilgrims scattered in terror before the sun returned to its rightful place in the sky. They got the show they came for, but it turned out to be more than they could bear. Even now some try to explain away the miracle at Fatima as a space ship. Ha! People can believe in UFOs, but not in the power of God. As for Lucas, I choose to believe in him because I believe in Paco. Our little Aztec Gypsy has some special gift." I felt his strong hand grasp my shoulder. "Oh, how lucky you are to be going with Paco and his tribe," he said earnestly. "Keep your eyes open and unprejudiced, my friend. I shall want a full report when you return. Marvelous things may be revealed to you!" For all that, the first days on the road were remarkably uneventful. We traveled in a caravan of five buses and three trucks, stopping each night in a village or town to show a movie and tell fortunes. My great pleasure each evening was to sit with Paco at the entry area behind his mother and watch the crowd. The Gypsy queen used her "tools of the trade" to attract the country folk to having their fortunes told: a crystal ball she said had been in her family since the Moors invaded Spain, a set of well-worn tarot cards, two decks of crisp playing cards she melded with masterful grace in a cascade with her arms raised and her hands two feet apart, and a Ouija board. I realized after a few nights of watching her perform that these tools had nothing whatsoever to do with her "trade." A person gifted with vast insight into the nature of humanity, the queen needed only her spiritual vision to see into the hearts and souls of those who came to sit before her. Her canny nature sized them up when she first saw them walking on to the lot where the movies were to be shown. Her theory was that if she could hook a leading citizen, others would fall into line behind. It never failed. "Ah, señor," she would say to a man whose appearance and attitude suggested he was probably the mayor, or the owner of the billiard parlor on the village square, "how extraordinary to find a gentleman of quality in such a small town--an official, a statesman, a man of business? Please, I beg you, sit with me. I see wonders for you. Come, come, I'll make a special price. Perhaps I'll charge nothing!" At this point the queen would cascade the double deck of cards with a flourish and scatter them on the table. "Ah, I knew it! This one, this is the card of great riches! Come! Sit down!" Hokey as it was, it worked. When the session was finished, the queen might indeed forgo payment, particularly if the line of customers had grown enough to assure a good night. Those who followed the big shot, of course, paid in full. Although I found this sort of thing amusing, I began to fear after the first couple of weeks that it might turn into a relatively commonplace trip after all. I was not what could be called bored. I enjoyed being with the Gypsies. I enjoyed seeing something new every day, and I enjoyed the view of the world through Paco's eyes. He was bright and cheerful every moment. On smooth, paved roads, which were rare, he often rode on his old cart pulled by the dachshunds or in the wheelchair, pulled by Gypsy. It was the dry season, so all the roads were passable even as we got closer to the Pacific Coast and visited little towns in subtropical valleys. Some were quite beautiful. Wherever we went, Paco, the dogs and I were the "Greatest Show on Earth." I doubt that any dachshunds had ever visited the region, although German shepherds, called pastor alemán in Spanish, were everywhere. But Gypsy was probably the first seen pulling a wheelchair. Remembering too well María's hateful reaction to our little man, I proposed we introduce him to the public at his stellar best. I suggested a new way of heralding our arrival at each town. The Gypsies accepted the innovation at once. Previously, they had moved in and set up shop without advance publicity. After my plan was instituted, Paco boarded his wheelchair with a sign taped to the back: Come to the Movies! Get Your Fortune Told by the Gypsy Queen!, and started along the main street ahead of the caravan with Gypsy prancing before him proudly. I walked the dachshunds on a double lead at his side, in my other hand a portable tape player blasting country-style ranchero music while Paco sang the songs gloriously at the top of his lungs. It was remarkable how fast a crowd could form in a dusty pueblito with nothing in sight but a burro grazing in a grass patch or a bony yellow dog cowering behind a half-open door. They loved Paco. Once he opened his mouth to sing, his days as a freak were over. He became the darling of the girls. He told me he'd never been happier in his life. Even his back brace started feeling good. Most of the time we were allowed to set up in the central plaza, if there was one, or in a field at the edge of town if there wasn't. One night after the movies were over and the crowd had gone away, Doña Concepción gathered up her paraphernalia as usual, and I took up Paco in my arms. We headed for the bus. As it would have been improper for me to sleep in the queen's quarters, I had been farmed out to share the rear of a truck with the twenty-five-year-old man who was to marry soon. We had to pass his truck to get to the queen's bus. When we came abreast of it, a breeze lifted the flap covering the rear. The noise of the rustling canvas caused us all to look in that direction. We saw my roommate sitting on his sofa. On his lap, tightly enfolded in his arms, was the teenage girl to whom he had been betrothed since she was born. Their lips were locked in a passionate kiss. Mercifully, they did not see us. Paco could not suppress a giggle. "Stop that!" his mother whispered sharply. "I don't want them to know we saw!" She invited me to sit for awhile in the bus. "They are young people, and we have waited too long,"she said. "My husband, dead these two years, made me promise to keep them apart until the girl was eighteen. He had old-fashioned ideas, and I listened to him. But, I tell you, there will be trouble soon if I don't let them marry quickly. She just turned seventeen." She opened a trunk and took out several rolls of parchment, unfurling them on a table. They were star charts. "Gypsies must know their way around the stars. We are, perhaps unfortunately, star-crossed people. Yes, I consult the stars in matters of importance like marriage. I also use the charts for people who can pay handsomely." "Star-crossed? What does that mean, Mamacita?" queried Paco. She looked at him in his small chair and seemed to give her answer some thought before she spoke. "It means 'ill-fated,' my love. Gypsies have been persecuted for centuries. We are a people set apart from the mass of humanity, and that is sometimes displeasing to the world." He remained silent for a time, then said quietly: "I, too, was born star-crossed. I see now why God gave me to you. Only you would understand." I marveled at his insight. I asked him if he would like to sit on my lap to see the charts better. He was delighted. His mother pored over them. "Auspicious! How fortunate that this happened tonight! We are approaching a time when the marriage can take place. I would say any day in mid-February would be perfect for them, perhaps between the tenth and the twentieth." I lit up like a Roman candle. "Valentine's Day! El Día de los Enamorados, the Day of the Loved Ones!" I shouted explosively enough for Gypsy and the dachshunds to scramble in from outside to see what was going on. "Of course!" cried the queen. "Why didn't I think of that?" "Because if you thought of everything, Mamacita, my pinchi gringo would have nothing to do!" Paco rested his head on my chest and sighed. I felt appreciated. I went over to the truck to summon the couple to present themselves to the queen. Expecting me home, they had left it, but I found them sitting together beside the fire at the center of the camp, her head on his shoulder, looking very much in love. They liked the idea and accepted it at once. The day before Valentine's Day, we stopped on the road to break for lunch. The countryside around us needed the rainy season to perk up its browned vegetation, much of it low-lying and sere. We were headed for a nearby subtropical valley that the queen considered ideal for the wedding. Paco and I left the road on smooth ground with Gypsy pulling him on his old cart with the dachshunds romping on ahead. I carried a lunch basket for us. No spot looked right for a picnic until we came to the top of a small rise and saw a gnarled and stately tree, leafless, with low-hanging limbs. Providing a splash of bright color in the brown landscape, off to one side of the tree grew a rectangular bed of vivid Mexican marigolds. We picnicked to our heart's content. I stretched out after eating and napped, using a patch of marigolds for a pillow while Paco watched the dogs at play. I woke up with a start, feeling slightly drugged. Not until I noticed the crushed blossoms under my head did I recall that Aztec priests had concocted powder from these flowers for use in stunning victims for human sacrifice to their bloodthirsty gods. It gave me an eerie feeling. Paco sat beside me, wide-eyed. The dogs lay nearby, staring at him, transfixed. "Lucas was in the tree," he whispered. "He was sitting on that branch." Nothing was on the branch. I frowned. "He was there!" Paco insisted. "Did he bring a message?" I asked, getting goose bumps even while I spoke. "The priest will know you." "That was the message," he said. "The priest will know you." "What does it mean, Paco?" He sighed. "I don't know." We heard the horns of the whole caravan honking down below. Everyone was looking for us. When we came into sight, the Gypsy queen ran to meet us. "You gave me such a fright!" she cried. "Where have you been?" We told her about the old tree and the tiny garden growing beside it. Doña Concepción shook her head and glared at me as if I ought to know better than to disappear like that. She was right, and I felt a bit ashamed, but when Paco spoke of Lucas's latest visitation, she insisted on going to see the tree herself. When we approached it, she stopped short. "I have been here before. It looks different, but I know that tree. The flowers--they were not there, but this place, that tree....."
Her voice trailed off. She turned quickly and started back toward the road. "Come," she said, "we must reach the wedding village before dark. I must make preparations for the wedding tomorrow." The pueblito was indeed a charming place. There was a village square of cobblestones in front of an eighteenth-century pink church of ornate rococo design. Orchids hung from the trees clustered around a bandstand in the small plaza across the way. Beyond that were four unpaved streets, each no more than a block in length. The people were humbly dressed, but friendly. We showed the movie for free that night and asked all who attended to join us at the wedding on the following day. Doña Concepción introduced me to the earnest young priest she found in the church, and the two of them set about making plans for the ceremony. It was decided that the church service would take place in the late afternoon and that everyone would then adjourn to the plaza where the Gypsies would provide some entertainment. The next morning, the Gypsy queen and three other Gypsy women fitted the bride's gown. It had belonged to the bride's great-grandmother and was a creation of antique Spanish lace. The young priest was accommodating in every respect. He said he was new to the parish and wanted to break away from staid tradition and do things in new ways that might attract the young people of the district. He was obviously thrilled to preside over a wedding of Gypsies. Nothing like this might ever happen to him again. He stammered during the ceremony and blushed. We were told that every villager and quite a few farmers from the countryside came to our reception in the plaza that day. The Gypsies made churros, deep-fried and crispy crullers redolent of cinnamon sugar. There were caramel apples, mangos and papaya, and we had contracted with local families the night before to supply us with tacos made of a local delicacy--iguana, which tasted like Louisiana frog legs--and fresh pulque, a low-alcohol content beverage made from the maguey plant. For children and the ladies, there were foamy Mexican hot chocolate and soft drinks. The music was supplied by three of the Gypsy men with guitars and a violin, joined by a group of local boys with brass instruments who liked to think of themselves as a budding mariachi band. The combination was surprisingly good. Doña Concepción, her dark hair pulled back in a tight chignon, her throat and breast adorned with a dozen collars of gold, danced a fiery flamenco. It was in her blood, as all could see. She hypnotized the simple villagers with staccato taps and the taut but graceful movements of a jungle cat. She was every inch a Gypsy queen. In her fifties or early sixties, that evening her features glowed with vestiges of the beauty which must have been hers in youth. The centerpiece of the gathering, however, was Paco. We set him in a comfortable chair in the middle of the gazebo that comprised a bandstand in the plaza outside the church. Its flooring was strewn with fragrant Aztec lilies. When Paco began to sing, the people, many of whom had looked at him askance earlier in the day, rushed to the bandstand. The startled looks on their faces were amusing to watch. Paco turned to me and winked. His handsome, chocolate-eyed visage and sweet, plaintive voice were nothing if not crowd-pleasers. He inspired adulation from an audience. His repertoire included many ballads in waltz-time. Much requested by the audience were songs of the revolution and civil war earlier in the century when Pancho Villa and Emiliano Zapata were the heroes of the day. "It is the Day of the Loved Ones," he shouted at one point, "a day of weddings and love, the day of Saint Valentine. I'm going to sing Valentina, my favorite revolutionary song!" He called for the bride and groom to dance through the square while he sang. It was a ravishing performance--a beautiful girl in the bright colors of a swirling china poblana dress and a handsome young man wearing the tight, silver-spangled outfit of the fancy cowboys, the charros, of Guadalajara. They waltzed among the trees around the bandstand as the crowd gave way. Paco's voice rang out, perfectly suited to the song: "One passion dominates me that makes me come to you, Valentina," going on to sing a young soldier's lament to his love that although she sees him drunk tonight on tequila, he'll be drinking sherry tomorrow in heaven, but she won't see him anymore. "So they might as well kill me now." The emotional Mexicans loved a sad song. There wasn't a dry eye in the plaza, man or woman, by the time he was done. The cheers and applause were thunderous, with the audience demanding a reprise from the dancers as well as from him. During the encore, an elderly gentleman in a warm greatcoat, sitting on a bench near the bandstand, motioned to the young priest, who went to him at once. They whispered together. The priest helped the older man to his feet and assisted him to the gazebo where he peered at Paco through the railing. Next, the two men made their way to the Gypsy queen, who sat regally on the gazebo steps. They spoke quietly to her for a few minutes. She turned around to look at Paco, her face pale. I distinctly observed panic in her eyes. She swayed. The young priest offered his arm to steady her, but she rejected it and waved him away. Turning her attention back to the older gentleman, she hunched forward and seemed to be asking questions. He kept nodding his head in assent, then stood up from his bent position, bowing to Doña Concepción. When we returned to our encampment at the edge of town, the Gypsy queen did not mention her conversation with the two men. She seemed preoccupied and asked if Paco could sleep in one of the trucks with me. I gathered that she felt an overwhelming need to be alone. I agreed, of course, and retired to another truck which had two cots at the rear. Paco took one and I the other. He fell asleep in a trice, but I lay there wakeful, fretting over what could possibly have so disturbed Doña Concepción. The bridal couple, of course, now occupied the truck I had shared before. I saw them the next morning. They were deliriously happy to be wed at last. There was to be a delay in our departure, I was told. Usually, we left early, but no time was given for leaving that day. When I relayed this information to Paco, he wanted to see his mother and asked me to take him to her. As I climbed down from the truck, Doña Concepción came round the corner, unsmiling. "Lash that canvas cover shut, please," she directed, "and get into the back seat with Paco. We have a trip to make." The crisp behavior was uncharacteristic and indicated deep concern over some matter I could not fathom. She drove us to the old pink church. "I'll be back," she said briefly and entered the church. She emerged a few minutes later, trailed by the older man with whom she had spoken so earnestly at the gazebo. I was startled. Without the greatcoat he had worn the night before, which had covered him from neck to knee, I could now see that he was a priest! The cleric climbed into the front seat of our crew-cab truck. No introduction was made. An almost sinister silence prevailed as we turned back over the road we had traveled to reach the town. Paco trembled, pressing himself into my side, sensitive, as always, to his mother's moods. We turned off the road where we had taken our rest stop and drove over the brow of the hill. Dismounting from the truck, the old priest led us to our tree. I carried Paco in my arms. "This is the place," the old man said, looking at the Gypsy queen. "I am happy, señora, that you decided to come today." Doña Concepción sighed. "I had not planned this. It was my memory of the handsome pink church that brought me back, only for the wedding. Perhaps also I wanted Paco to see it, even if he did not know of its significance to me. When our caravan passed through one morning twelve years ago, I went into that church and prayed for a son. I promised God it was the last time I would bother Him with my endless entreaties. I heard a voice. It told me to find the midwife tree. I asked a lady in the plaza. She pointed out the way." She glanced at Paco. Apprehension had crept into her voice. "Please, Father, tell your story." The old man cleared his throat and leaned on his cane. "She came to me in the middle of the night. I knew her only slightly as she rarely visited the church. Her husband was a brute who understood nothing of love, a godless man who never came to Mass, who never confessed, who never breathed a prayer. There were eight children crammed into what was little more than a hut in the hills. He had ordered his wife not to bear any more, but what could she do? In his drunkenness he would come upon her like a demon in the night. She had no defense against him. "Her belly began to swell with another child. He was furious and beat her mercilessly. Day after day, he pounded the child in her womb with his fists, trying to abort the helpless, unborn thing, but the fetus had a relentless will to live and would not die." The priest wiped his eyes. Paco shook like a leaf in my arms. 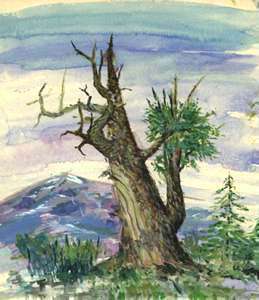 "When her time came," the priest continued, "she made her way here to the midwife tree. It has been used for centuries as midwife to the Indian and the mestizo population. The women squat beneath it, clinging to the strong lower branches for the leverage needed to expel the child. It is a painful, primitive process, but countless generations have been born thus. "Imagine her horror when the struggle ended, and she saw what her husband's pummeling had done to the fruit of her womb. The poor little mite of a boy had upper, but not lower arms, and his legs were cut off above the knees." Paco stiffened and closed his eyes. "If she took this fragment of a child home, her husband would have killed it on sight," the priest's voice droned on. "What was she to do? She cried out to God and told Him of her plight. A moment of decision came upon her. She stripped off her ragged dress. Wrapping the baby, she placed him gently beside the tree, then dragged herself to that gully over there and began to pray for someone to find the midwife tree and save her poor, malformed son. She prayed that God would send a worthy person to give him whatever they might of love and life. "A miracle! Her prayer was answered at mid-morning when a beautiful lady dressed in bright colors and shining with gold appeared on the hillside, found the child and took it away. She was convinced that God had sent an angel, for the lady was like no one she had ever seen. "In a fatally weakened condition, she waited for darkness, being naked, and then stumbled down to the village. She made her way to the church, instinct guiding her to me. I covered her at once with the altar cloth. No sooner had she told me her story than she simply died in my arms." The priest shook his head and stifled an angry sob. "Outraged, I took up a candlestick from the altar and ran to the shack in the hills and burst through the door. The husband was there. I flailed at him, crying, Murderer!, and shouting what he had done. God forgive me for terrorizing the children. I might have killed him before their eyes! But I came to my senses and rushed away to find our policeman. How foolish of me! I should have gone to the policeman's house first! The husband disappeared without a trace, thus escaping civil justice, although I am certain he could never escape the wrath of God. Left without family, the children were sent off to orphanages. "I buried her here, where you see the rectangle of marigolds, the flowers of death, thinking this is where she would want to be. I consecrated the ground." He turned to Paco. "Son, when I heard you sing last night, I was so moved I had to have a closer look. My eyes are not as good as they used to be, so I called over the young priest who has replaced me in the parish. He helped me to the gazebo. One good look at you took my breath away because in the same line of vision I saw the Gypsy queen--her colorful gown, the bracelets, the chains, the necklaces of shining gold, like a fairy descended upon us from beyond the rainbow. It all came clear. "I have just retired from the parish after fifty years. I was to have left for Mexico City yesterday, but the truck taking me to the main bus line broke down, and there were no parts for repair. I was stranded here, I thought, for no reason. But last night, God revealed His purpose when He led me to you." Leaning against the tree with a drawn-out sigh, he appeared to have finished. I thought of what Lucas the Angel had told Paco: The priest will know you. I couldn't help glancing at the midwife tree to see if an angel's feather had lodged in its branches. Thinking I had fallen under Lucas's spell, I gave myself a good pinch to bring me back to reality. Following a long silence, another voice was heard. "Father, what was her name?" asked Paco softly. The old priest answered: "The same as your favorite song, the name you sang that jogged my memory of that night at the midwife tree...Valentina." Not another word was spoken until we returned to the truck. "Please let my mother carry me," Paco said before we got in, lifting his arm stumps toward Doña Concepción. She took him to her bosom with a trace of apprehension still lingering in her eyes. I quite understood. She knew this experience had been hurtful to him, but, as she had told me once, she never sought to hide life's pain from him. "He was born with it in his heart," she had said then. Withstanding bitterness now would depend on the strength of his character. There was nothing she could do. As I revved up the engine and turned the truck back toward the pueblito, out of the corner of my eye I observed Paco kissing the Gypsy queen tenderly on the cheek. "I love you, Mamacita," he said. "You will always be my valentine." I caught my breath. In Spanish usage, his declaration represented more than a simple sentiment. The word "valentine" was seldom used that way in his language. Rather, in using the word in its feminine form, valentina, he not only honored his birth mother, but also declared his undying love for Doña Concepción. Her taut nerves relaxed by his heartfelt declaration, the noble lady burst into tears and buried her face in his luxuriant black hair. "Thank you, Father, for all you have done," Paco said over the Gypsy queen's shoulder to the priest, who sat in the back seat. "Yes, Father," added she, recovering herself, "and if you don't mind taking your time getting there, we would be happy to have you travel with us to Mexico City after Lent begins in a couple of weeks. We abstain from business during that period to repair our vehicles and equipment." "I accept happily, señora!" the old priest responded. "I have nowhere to go except the retirement home in the capital, or wherever else God may lead me. He has brought us together already. Perhaps there's something else up His infinite sleeve!"